Jockey Gay Kelleway, who trains Chelmsford hopeful, September Issue. Carolinae can book her ticket for All-Weather Championships Finals Day for the second successive year with victory in a fast-track qualifier at Chelmsford on Friday. 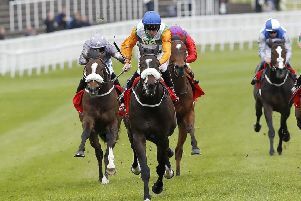 The Charlie Fellowes-trained mare was only beaten three and a half lengths by Realtra when a respectable seventh in the fillies’ and mares’ final last April and it looks like her campaign is again geared towards another crack at the big prize. Fellowes gave the daughter of Makfi a nice break after she ran below par in a Listed race at Naas in July and has brought her back with the likely aim of getting her to peak in the spring. She was a close third behind Stellar Surprise at Wolverhampton on her return over Christmas and again ran encouragingly when second to the same horse late last month. Carolinea should now go close in the totetrifecta Pick The 1.2.3 Fillies’ Conditions Stakes. Shamrokh got up close home to deny My Amigo by a neck over a mile on this course a week ago for which he did not incur a penalty as it was an apprentice race. Mick Appleby’s charge has an extra two furlongs to travel in the toteswinger Two In The First Three Handicap, but has run well over that trip in the past. It might be worth taking a chance with the top-weight September Issue in the totescop6 Rollover This Saturday Handicap. The Gay Kelleway-trained five-year-old should be all the better for finishing sixth behind Sparkalot at Kempton last month on his first start since August last year. Karijini has won both her starts since joining trainer Archie Watson and can complete the hat-trick in the Betway Casino Handicap at Newcastle. The four-year-old has struck at Chelmsford and Lingfield since her move from Simon Crisford’s stable and more improvement is likely as she has only had four career starts. Kodi Beach is another lightly-raced performer who can continue on the upgrade by gaining a second successive victory. The three-year-old gelding, trained by David Barron, opened his account at the third attempt with a clear-cut two-length verdict over Decision Maker in a five-furlong maiden at Southwell last month. That was step up on his previous run in October and the son of Kodiac looks to have a workable mark of 77 in the 32Red Casino Handicap. Brandon Hill ran a solid race when third to Tintern Theatre at Kempton’s Christmas meeting after being well-backed on what was only his second appearance of the season. Being fresher than most, the Tom George-trained 10-year-old can get his head in front in the Matchbook Betting Podcast Handicap Chase on his return to the Sunbury track. Happy Diva got off the mark over fences with a sound display at Ludlow and Kerry Lee’s seven-year-old can repeat the trick in the EBF TBA Mares Novices’ Chase at Bangor. BANGOR: 1.40 Happy Diva, 2.10 Whiskey Chaser, 2.45 Numbercruncher, 3.20 Tommy Rapper, 3.50 Steel City, 4.25 The Road Home, 4.55 Baby Ted. CHELMSFORD: 1.30 Nice Shot, 2.00 Jumping Around, 2.35 Ertidaad, 3.10 CAROLINAE (NAP), 3.40 Shamrokh, 4.15 September Issue (treble), 4.45 Langlauf. KEMPTON: 1.50 Templier, 2.25 Ok Corral, 3.00 Modus, 3.30 Broken Quest, 4.05 Brandon Hill, 4.35 Balli Martine. NEWCASTLE: 5.45 Bad Dog, 6.15 Loyal Promise, 6.45 Karijini (next best), 7.15 Kodi Beach, 7.45 Joyful Star, 8.15 New Orleans.